I do remember answering the generic questions asked by my primary teachers, when they had nothing to do in the class or when there is a visit to the classroom by the school principal. “What would you like to become?”. Sounds a familiar question? But I would never have replied that I wanted to work the dreams of the software firm on quality product to a piteous customer, who is in need of a business solution he could barely imagine. We make them believe that its possible. And then rest is what we do. Yippee! 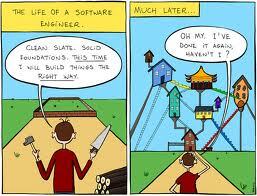 I’m a software engineer! All I need sitting in front of the machine for long hours, is a smooth execution without bugs so as to take my hands off the scrambled alphabetical pad. I’m trying to work on the dreams of the firm. I barely do. It’s not very common that people become what they really wanted to. Or what they are passionate about. My idea of this long haul is to arrive at the term ‘passionate living’, that makes our life ‘authentic’. Ironically, I’m the living proof. It did not occur to me that, what I am really passionate about. And by the time I come in the realization phase, I am already a programmer filling the void. My codes are partially cursed from the inner whine but I enjoy the work. I really do. I have a business card bearing my name but the soul knows nothing of it. The materialistic profession keeps the body alive and fills the monetary account but the soul is clueless. My work becomes routine, and the unexciting mundane routine is indeed lethal. #Dangerous. This makes me feel that we don’t give enough room for the innate qualities to develop or we don’t discover that something exist within us. We don’t listen to our hearts. How many of us are good singers, writers, players and are gifted with born talents? And when are we going to realize that we just trade these talents for money? Indeed, it’s not easy for an individual to try and succeed in something, unless there is a voice of encouragement. We don’t dare to try alone and then we become accustomed with society and the way we have been raised from birth. How parents should raise their kids. They must say ‘be yourself kid’. Rather, here we go. The Indian dad says ‘Look at Sharma’s son. He got A grades in all subjects and he is going to become an engineer. You should be like him’. The shepherd in ‘The Alchemist’ is my favourite and bravest of the characters, which risks and goes in search of the dream following his heart. If I remember Robin’s philosophy deriving the book, it is believed that if when we go in search of our dreams, the universe helps us to achieve it. We sense the presence of something called ‘a sign’ that would help us to accomplish our dreams. Things work positively. That’s a nice book. We can’t refute the fact that there is a lot to risk and much to lose while going in search of dreams that we don’t experience in our comfort zones. But I say, do the work and also bring the life to the born-talent. Let’s be someone besides our professional tag. Lets not merely exist, but Live ! I’m trying. Wish me luck. ‘If you live a life you love, you don’t need a vacation to escape‘.